Every university provides a unique student experience. Using this creatively can set your institution apart from competitors. 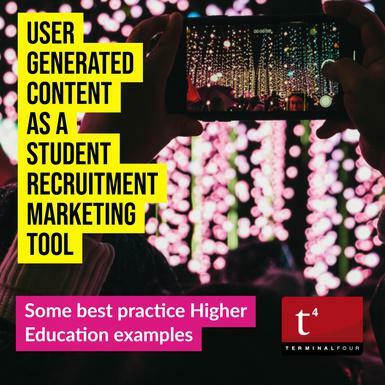 And there is no better way to convey these differentiators creatively to prospective students than through authentic user generated content (UGC). UGC posts shared to social channels see a 28% higher engagement rate than standard organic posts and it can be used to showcase all elements of university life, from faculty studies to sports teams, music groups and social occasions. In terms of student recruitment, 89% of applicants state they want to see content created by current students and over 80% rely on word of mouth to make their university decision. By displaying UGC you can build awareness for your offering with prospective students, telling the stories behind all aspects of campus life. 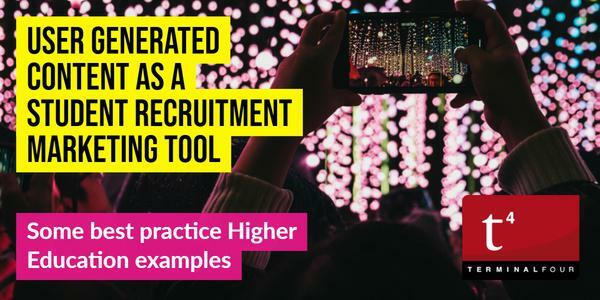 And the benefits of UGC extend beyond recruitment. UGC can also capture treasured moments for existing students and faculty and provide a useful connection for parents and alumni through an ever-evolving visual narrative. UGC takes many forms, from quotes to testimonials, great photography, and engaging videos. Universities can nurture the development of this content by publicising hashtags, which are relevant to prospective and current students, alumni and faculty, around campus. These can be shared in printed materials, at events, across the website and of course on social media. Hashtags can become a magnet for moments of university life. Georgia State University (GSU) in the US, for example, used social media to generate a community spirit and connect with students living both on and off campus. Their Back to School Week campaign saw students include a hashtag (#PantherWelcome) on the photos of the first week back. GSU used Tint and an integration with Hootsuite to collect, curate, and display content from social media in interactive ways. Allegheny College created a page on its university website listing its various hashtags. One of the popular hashtags #acgatorgram now has over 4000 posts with consistently high engagement. Review the content calendar for your institution regularly to identify events and themes across the year such as homecoming, studying for finals, parents' weekend, sporting events etc. which are well suited to UGC. Corresponding hashtags can then be set up and publicised. Purdue University, for instance, raised a staggering $28m in 24 hours for its annual day of giving through careful planning and the help of UGC. Meanwhile, Allegheny College includes upcoming events in its hashtag listings page on their main website. Institutions can initiate ambassador programmes. Babson College for example benefits from influencers in the community who convey a wealth of accurate knowledge about the institution, which spans a wide variety of academic and co-curricular interests. The University of Albany created an alumni ambassador programme to involve those who have been through the university experience from start to finish. Another approach to incentivising UGC is to run contests. Minnesota State University Moorhead offered scholarships to the winners of their #BeADragon campaign for the chance to win a $2,500 scholarship. Events are an ideal place for UGC as attendees are usually keen to share their experience in the moment and the options to make the most of the content are endless. Skyline University College in the UAE, for example, wanted to create more of a two-way conversation with students and increase the engagement with social content. The university set up screens across campus displaying UGC using Tint and mirrored this content on its website. Over the first three months, it experienced a 448% increase in social brand impressions and a 489% increase in the number of posts using the brand hashtag. The University of North Texas uses Zoomph to display UGC at high school preview days, during orientation and during Homecoming. And the University of South Carolina uses Tint to show moderated UGC before and after the commencement ceremonies. They also make use of new functionality, which enables grandparents, parents and students to text images for inclusion, with admins having control to monitor and publish the content. Authentic, interesting content is trusted by prospective students. It’s clear that today's prospective students respect and trust the opinions and content of their peers. In 2019 UGC will continue to gain traction and make its way into new spaces such as being embedded into open day interactive tours and campus maps. By monitoring social activity, engaging in conversation and encouraging the aggregation of content, institutions can really benefit from UGC. What initiatives do you have in place to support the creation of UGC?